Anybody else having a hard time believing that it's the last day of October already?! Man, this month went fast. Super fast! As mentioned in my previous post, last weekend I was doing some decorating for a church Halloween party. It all went great. The hanging spiders looked cool and the bats added a nice touch to what would have been empty walls. The Giant haunted house silhouette wasn't so giant but that's ok, it was still big and looked good on the stage. Did I take any pictures of these things? NO! I can't believe I didn't take my camera along - ugh! 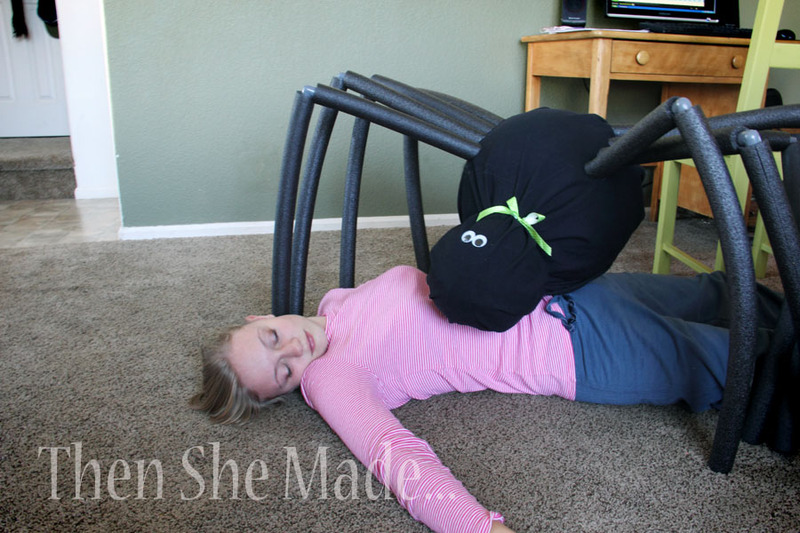 The good news though, I do have photos of the giant spider I made and I even have a little DIY tutorial too. 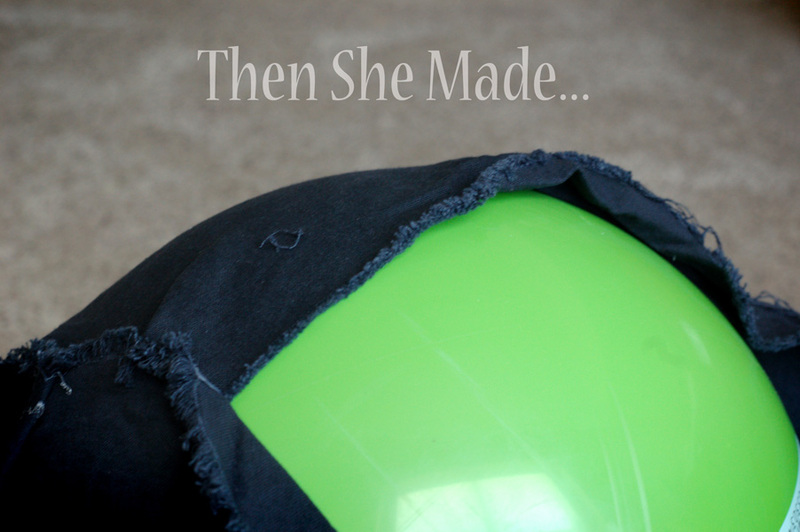 I realize it's a little late for you to make your own for this year but you can always tuck this idea away or better yet, Pin it on Pinterest and then you'll have it for next year. And, when I say giant Spider, I really do mean GIANT. Just for comparison sake, my daughter is 5.5. Ya, it's kind of big. My younger daughters named it "Winter" after the dolphin in Dolphin Tale. I kinda thought Charlotte might be more appropriate but, you know, whatever... so here's how I made "Winter." - Two balls, I used a leftover big bouncy ball from our summer and then a paper mached balloon. If I had a smaller ball I would have just used that. 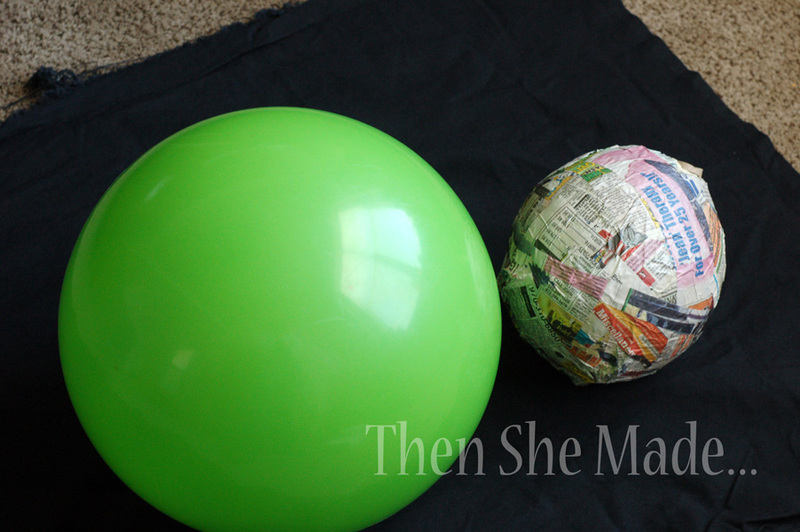 Step 1: Glue your two balls together. I just used hot glue but you could probably tape them together instead. 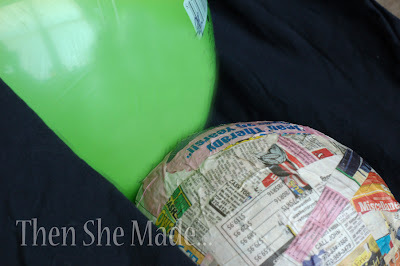 Step 2: Wrap your fabric around the two balls and start securing it in place. You will need to "pull, fold, & secure, then repeat", the fabric as you go. You want it to keep the round shape as much as possible. Also, it will look better if you keep all the seams and folds on the underneath side as much as possible. 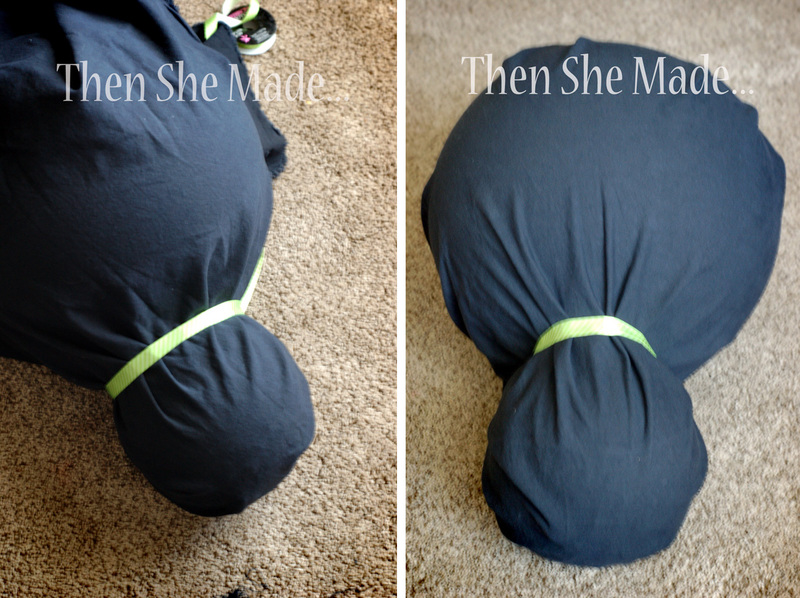 Step 3: After you get all the fabric wrapped around the form, tie the string or ribbon around the neck. This will help separate, visually, the head and the body. 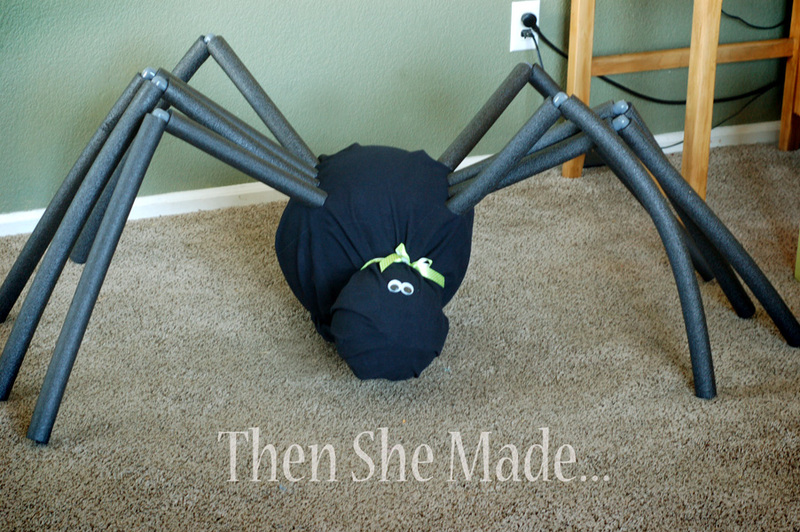 Plus, it looks kind of cute with a little bow (see photos of finished spider). Step 4: I wasn't so great about taking pictures on this part but I think you can kind of figure it out by looking at the completed spider. Plus, I will try and explain it here. 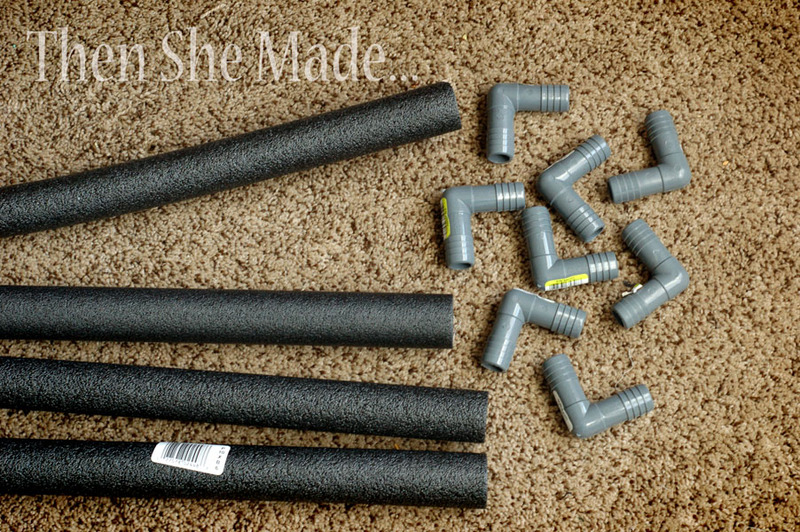 For the legs, take one foam pipe cover and cut it in half. Each pipe cover with make two legs, so one half is one leg. Next take one of the halves and cut it again. This time just cut it about 1/3 the way down. You want each leg to have a short piece that comes off the body and then a long piece that continues after the "bend". Does that make sense? 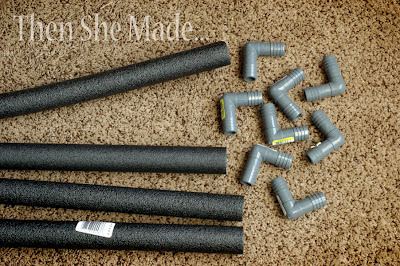 After you have your leg pieces cut, take one pipe elbow piece (the little gray things) and attach the short piece of foam to one side and the long piece of foam to the other. Then, glue each leg to your spider body. TIP: When you are attaching the legs the body, it does help if you cut the foam at a slight angle first. This way the legs kind of curve with the body instead of being glued on at a 90% angle. 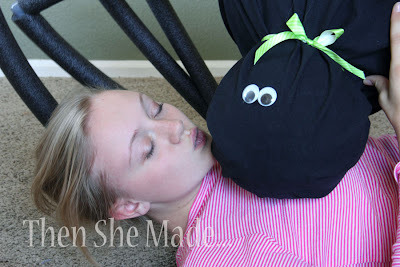 Step 5: After all the legs are in place, just add eyes and your done. Pretty easy right?! This spider may just be the only kind of spider that we love. It's even kissable. The only thing left to do is put it on display. Currently, "Winter" is hanging out on our porch! I think she is planning on scaring trick-or-treaters. Hehehe!